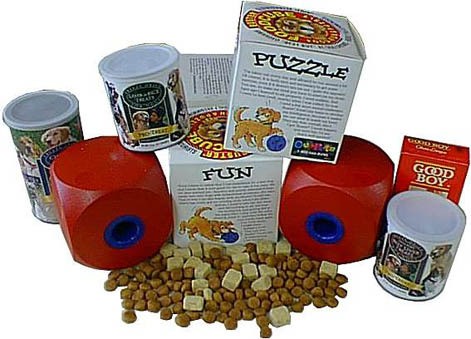 Leading Dog Behaviourists recommend The Buster Food Cube. Dog behaviorists point out that many behavioural problems can be avoided by mental stimulation, which provides a better life for dogs. 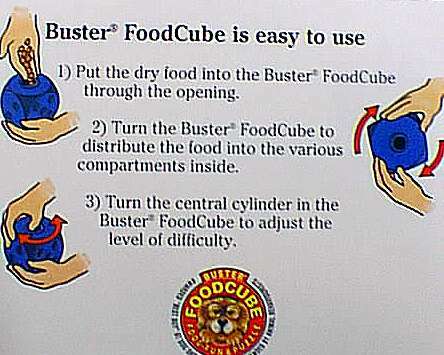 The Buster FoodCube stimulates and exercises the dog and helps him to concentrate and use up excess energy. It's the perfect occupational therapy for all dogs, because once they've worked out how to get at the food they are hooked. The Buster FoodCube appeals to dogs' basic foraging instincts and keeps them actively playing for as long as they are interested. Imported from Denmark, the original Buster Cube measures 5x5 inches cubed.